When it comes to celebrations, sweets are an essential. Whether it’s a birthday, christening, wedding or another kind of joyous occasion, we believe that sweet treats should always be readily available. 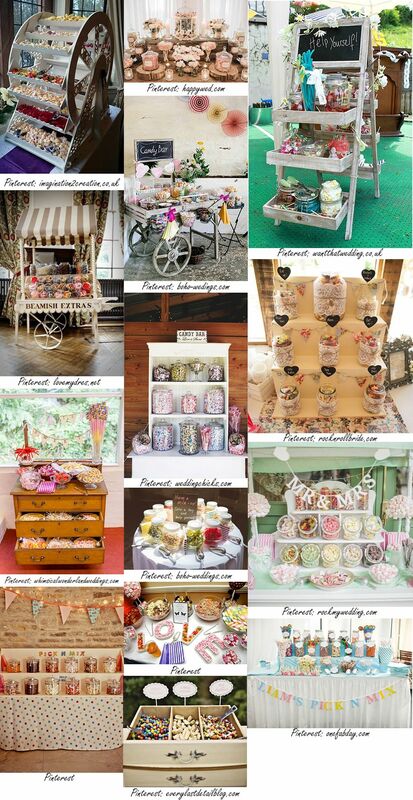 You could just put bags and bowls of sweets around the venue but if you want to give your guests the wow factor and present your confectionary collection in a slightly more impressive way, we’re sure you’ll be interested to hear our tips on creating your very own sweetie station. It can cost hundreds to hire a pre-made candy cart but we’re going to show you how to make your own candy buffet for just a fraction of the cost! The way in which you choose to build your sweetie station is totally up to you and really depends on your budget but as a starting point, you’ll need something to set your sweetie buffet up on. Whether you splash the cash on a traditional candy cart or just decorate a table, this is an important part of the overall look of your sweetie station. You’re then going to need décor, so this covers everything including a tablecloth, bunting, a sign for the station and anything else you want to use to dress up your pick and mix stand. One of the most important things you’ll need is the sweets because let’s be honest, no confectionary cart is complete without them. You could go to a wholesalers but a lot of people don’t have access to these kind of places and supermarkets are not the best value place to buy sweets in bulk. We’d recommend buying your sweets from us, the UK’s largest online sweet shop. Our retro sweet hampers and jars are packed full of all the sweets you could dream of adding to your selection and are available for low prices with efficient delivery. The only other things you need to think about and buy to complete your sweetie station are things such as jars or bowls for the sweets to sit in, scoops and tongs for guests to serve their sweets with and paper bags, cones or cups for holding your treats of choice. The way your sweetie station looks is down to you and is probably going to depend on the event and the theme of the occasion. You can decorate your candy buffet to fit in with the rest of the décor of the event or you can pick contrasting colours and décor pieces to help this part of the room stand out. Don’t Put All Your Sweets Out At Once – we all know the best part about hosting a party is the leftover sweets but if you fill your sweetie station with all the confectionary you’ve bought, you could end up with a lot of waste. Fill the jars and bowls you’ve got but keep some spare jars and bags unopened for back up and if you’re lucky, you might even get to bring those home with you. Get Plenty of Bags, Cones and Cups –you want people to treat your sweetie station like a proper pick and mix by loading up their bags with sweets instead of standing and picking, so make sure you buy plenty of paper bags, cones or cups for people to decant their sweets into. Don’t Forget Scoops and Tongs – you may be celebrating with friends and family but that doesn’t mean you want to forget about hygiene. You don’t want everyone putting their hands in the bowls and jars of sweets, so make sure there are more than enough tongs and scoops for people to use to pick up their sweets! Sweetie stations can be affordable to make and are always a great addition to any celebration, so we hope you’ve found this blog post useful if you’re on the hunt for some inspiration for your very own sweetie station or candy cart. If you made your own treats buffet for a party or event, we’d love to see, so send us your pictures on Facebook or Instagram!